Intracranial dermoid cysts are uncommon, and their clinical features as well as surgical management differ from patient to patient. Dermoids are generally benign lesions, but may cause spontaneous complications such as meningitis and/or hydrocephalus due to rupture and epileptic seizures depending on their location. Little has been reported about characteristic imaging findings with resulting therapeutic considerations, and only a few reports exist about associated hydrocephalus. Imaging modalities have changed and can facilitate differential diagnosis and follow-up if applied correctly. In this paper, we attempt to contribute our clinical experience with the management of dermoid cysts. The charts of five men and two women with intracranial dermoid cysts were retrospectively reviewed. The patients were treated between September 1993 and September 2006. Selected patients are presented in detail. Tumour location, size and radiographic characteristics varied in each patient. Clinical presentations comprised focal neurological deficits as well as epileptic seizures, persistent headache, mental changes and psycho-organic syndromes. One patient underwent delayed ventriculo-peritoneal shunting after ruptured fatty particles caused obstructive hydrocephalus. Despite dermoid rupture into the subarachnoid space, three patients never developed hydrocephalus. Diffuse vascular supra-tentorial lesions were seen in one patient as a result of aseptic meningitis. Diffusion-weighted imaging (DWI) hyperintensity in dermoids is related to decrease of water proton diffusion and should be used for both the diagnosis and follow-up of this lesion. Although dermoid cysts are known to be benign entities per se, their rupture can cause a wide range of symptoms including aseptic meningitis and/or hydrocephalus. This may be due to intraventricular obstruction and/or paraventricular compression. While rupture does not necessarily bring about hydrocephalus, radical removal of the tumour and close monitoring of ventricular size is required. Although not widely recognised as such, DWI is considered to be a useful imaging modality in the diagnosis and follow-up of dermoids. Orakcioglu et al. 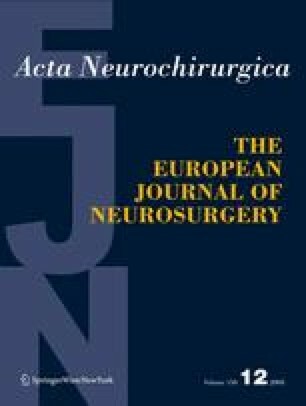 submit an interesting report on their experience with intracranial dermoid cysts and give an nice overview on the current literature. As intracranial dermoid cysts account for less than approx. 0.25% of all intracranial neoplasms, they are up 10 times less common than e.g. intracranial epidermoids. That is why a collection of 7 histologically proven cases seems worth publishing to me. The authors summarize all important information on the different clinical signs and symptoms of ruptured dermoid cysts. They conclude, that long-term follow-up is necessary because of the likelihood of post-op hydrocephalus. I completely support the author’s opinion, that DWI scans are the most useful imaging modality for diagnosis and follow-up exams.